While Montenegro have been rewriting EuroBasket Women history books in Katowice, Great Britain booked their ticket for the next phase of the competition in Bydgoszcz. Great Britain and Israel had lost their opening two games so it was clear that the loser would be going home. Israel were looking for their first win in 20 years while Great Britain for their first win ever. It took a three-minute burst between the first and second quarter in which Great Britain scored 15 unanswered points to decide the game. Leading (23-11) Great Britain never looked back and went on to win (74-51). 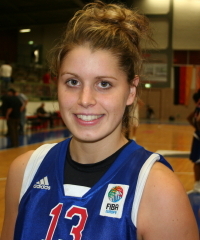 Johannah Leedham who has been out of action for almost six months led the GB attack with 18 points, 4 assists and 3 steals. Tom Maher was pleased with the victory and admitted he had been a bit nervous. He said "I looked at their players like Shay Doron and Liron Cohen and they are such great players so I knew it would be hard for us. However we just knuckled down and it was a comfortable win in the end. I think our performances here so far have been terrific. To get within 15 points of Belarus and Czech Republic is reaching a high level for us." While the game between Great Britain and Israel was important in terms of qualification, the big match of day 3 was the clash between the Czech Republic and Belarus. Belarus paid the price for sleeping in the first quarter (9-23) as the Czech Republic held them off at the end (67-62). As a result the Czech team takes maximum points into the next phase. Lithuania, already qualified, had a poor shooting day against the Slovak Republic and ended up losing (46-57). The result has no effect on the final standing because the Slovak Republic had already been eliminated. Russia got their act together for the first 10 minutes against Turkey and led by 22 points (29-7). Turkey picked up later in the match but the damage had been done. 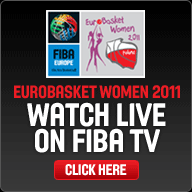 You will be able to watch video highlights of all the games at FIBATV for free.